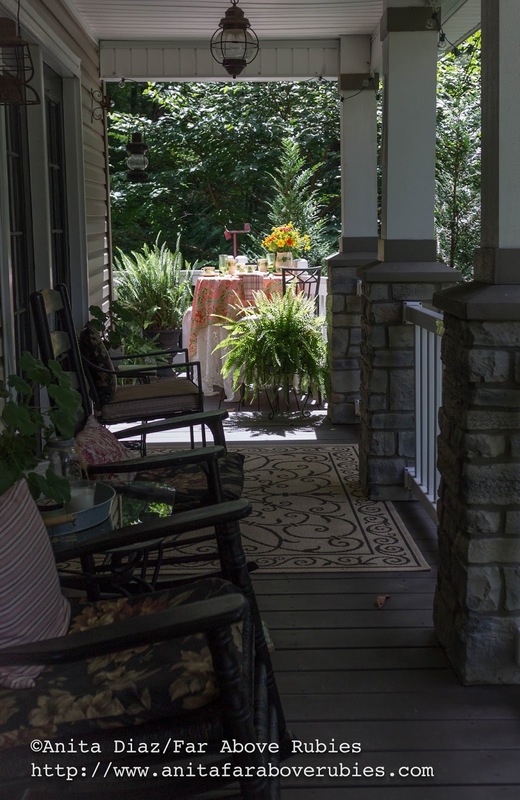 Well, it's not really fall yet, but autumn is certainly in the air here in the mountains, and it was the perfect day to set a table on the porch. A while back, I received a message from a high school friend I had not seen in years. 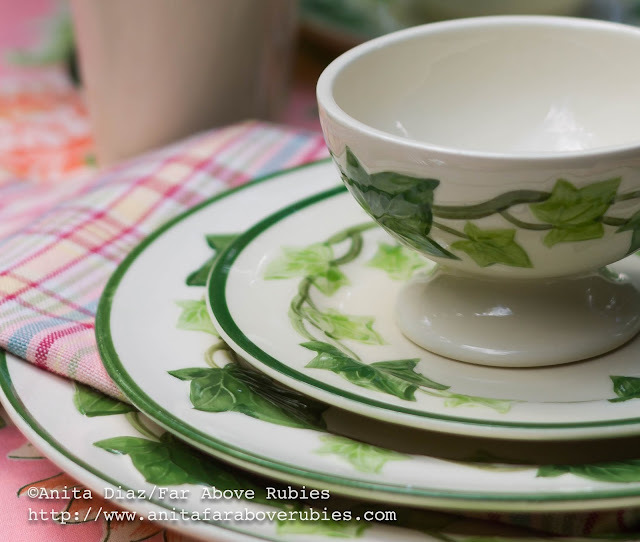 She had seen my blog and knew how much I love the Franciscan "Ivy" dishes. She told me that she had her mother's complete set packed in boxes and really didn't want to keep them, then asked if I wanted them. What??? Y'all know I didn't think twice about that! Seriously, I thought she wanted to sell them, but she just wanted to give them to me. I was blown away because most of the ones I had were older and chipped, so I was beyond excited to have them--especially, since they had been in her family. Since she doesn't live here, she would drop off a box when she came up, and I can't tell you how happy I was every time I opened up a box to find pieces I did not have -- really, I was like a kid at Christmas. She brought another box a couple weeks ago, and even though we have been using them for everyday, I knew I wanted to set a special table with them. But that's not the end of the story. 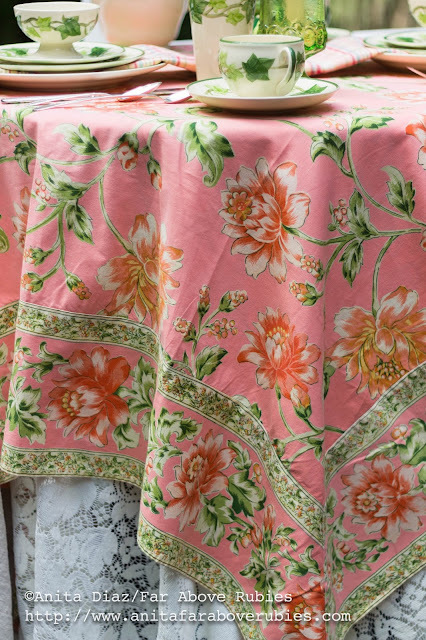 Another friend, who used to be part of our church, brought me a gorgeous coral/salmon vintage tablecloth and napkins several months ago. Because the napkins that go with the cloth were so delicate, I decided to use these plaid napkins I bought from Amazon this summer. I love the multi-color plaid along with the floral pattern, and love how the colors work so well together. I can just see Ricky and Lucy drinking from these cups and saucers on the I Love Lucy show. 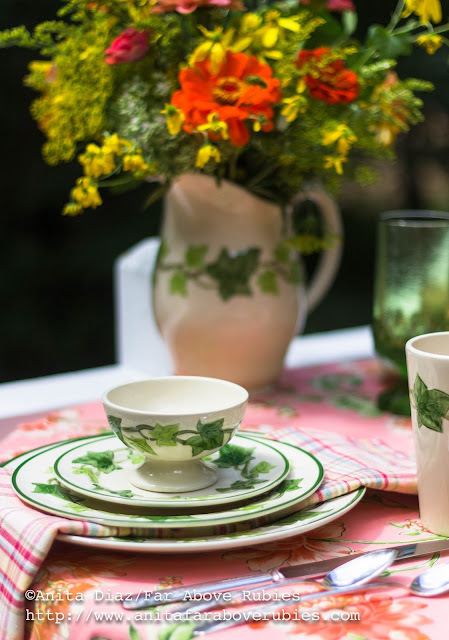 The iced tea glasses are Franciscan "Madeira" and could not be more perfect with the "Ivy." I was especially excited when I saw the "Ivy" salt and pepper shakers in the last box I got. Ok, I seriously jumped up and down. I have wanted these forever but never found any in good shape in my price range. I paired the Franciscan "Ivy" with the Oneida "Meadowbrook" silver plate flatware my mom put together for me after finding a pie server in the same pattern that belonged to my grandmother. I love this fun, vintage, but still fresh and modern table, and it's perfect for the beginning of the fall season. But, honestly, what makes this setting special for me is knowing two different friends thought I would love these things enough to pass them along to me. Thank you just doesn't seem to be adequate to express how grateful I am for these girls. It means so much to me to have these beautiful things to take care of, to breathe new life into and share with my family. Thank you SO much Pam and Alicia!! Absolutely one of my favorites. And the flowers are just gorgeous with this table setting. Such a lovely setting Anita. What a blessing both gifts were, especially the dishes! I love those little ivy salt and pepper shakers. 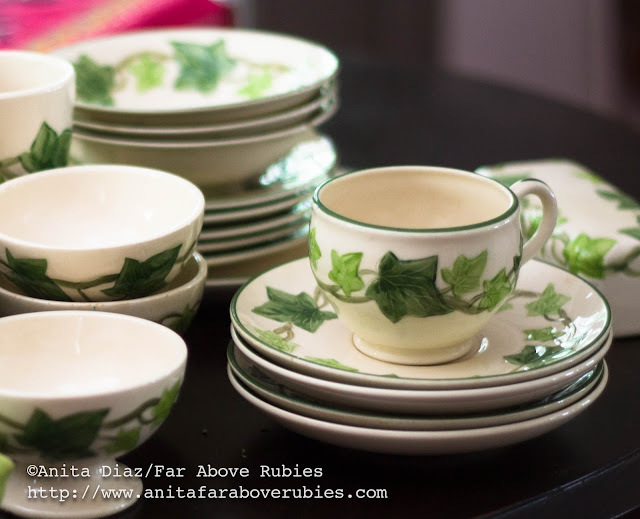 How so wonderful of your high school friend to give you the dishes from her family....so generous and thoughtful...She knew you would treasure them. They look great with that gorgeous tablecloth...I love the shape of the bowl and how cute are those salt and pepper shakers!....She knew they were going to a great home. Beautiful table setting Anita! One of my favorite color combos is pink and green and who doesn't love that vintage ivy patten. I'm agreeing with the others that wrote in that the salt and pepper shakers are the creme del la creme! How sweet of your friends to think of you in such a lovely way. What a perfect and gentle nod to bridging the gap between summer and autumn. 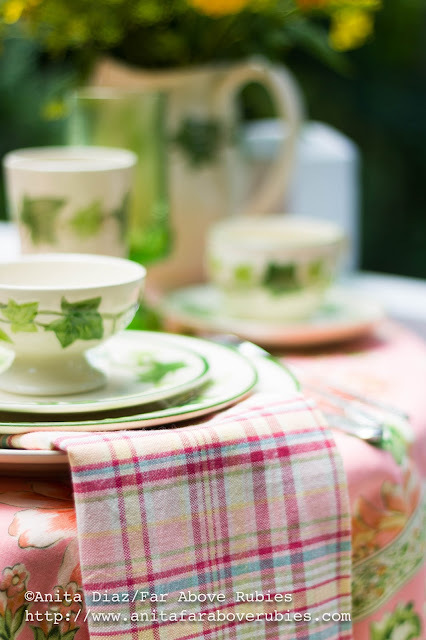 Your friend is amazing for the generous gift of those dishes, and the tablecloth brings everything together marvelously. 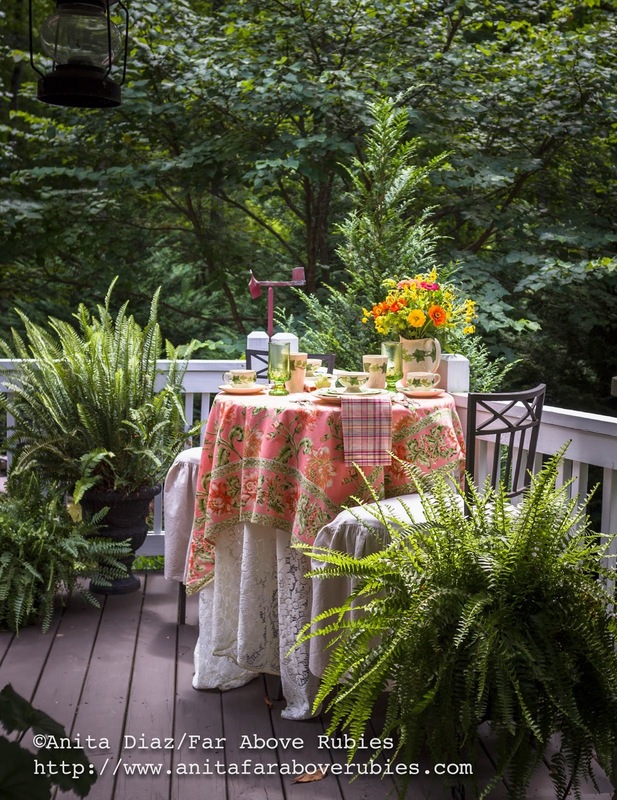 Your outdoor tablescape is amazing, looks so awesome. What a lovely spot to dine outdoors! Anita, what a thoughtful gift! Your alfresco setting is gorgeous. Wish I could wing my way over to dine at that pretty table. Love the dishes and the way you've paired them with the textiles. The pattern reminds me of the Napoleon Ivy that I have. Oh how sweet of your friend to pass these treasured things to you! They WILL get a new life and be lovingly cared for. I love the tablecloth, the colors are beautiful! The S and P are fabulous!!! The SETTING, however, is the best....like dining in a tree house! SO reminds me of our last house.......sigh. PS, can you tell me what type of ferns those are? They must be in the PERFECT spot! You have two wonderfully thoughtful friends, Anita! The dishes are simply lovely and are perfection with the tablecloth. And you definitely set a beautiful table. Enjoy your great weather and spectacular season, and thank you for your visit! Wow, what a fabulous gift! So much better that she give them to you than that she give them to a thrift store. I love it when people know our tastes! Such a great setting too! A pretty tablescape and a beautiful setting! I love the ivy with the pink. What special gifts you received from your friends! Anita!!!! What a wonderful gift!! You know I have an almost complete collection of Ivy and it warms my heart whenever someone falls in love with it, too. I've loved this pattern and collected it since I was 14, so that's over 43 years. I still love it as much today as I did the first time I ever saw it on TV. Your table is lovely and I love the fabrics used for the cloth and napkins, too. I know your friends will love the table you created with their special gifts. What a beautiful table! I so enjoyed reading your blog post today. Thank you. 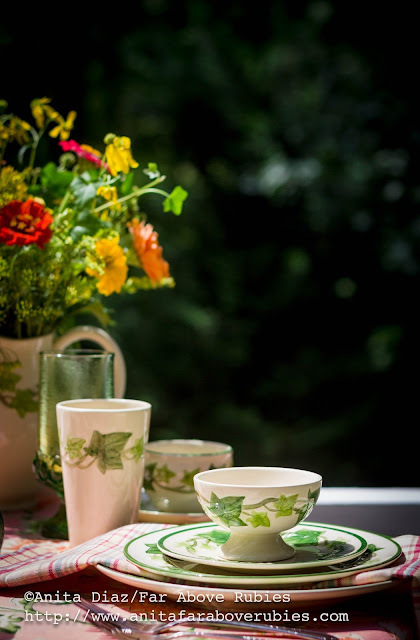 You truly have a wonderful friend to give you her mother's china. I love the Ivy pattern and remeber seeing it on I Love Lucy. 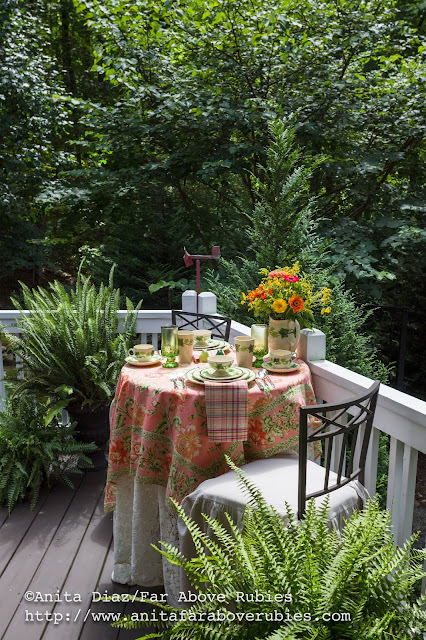 Your friend's tablecloth gift is the perfect basis for this outdoor garden dining scene. Excellent Tablescape! 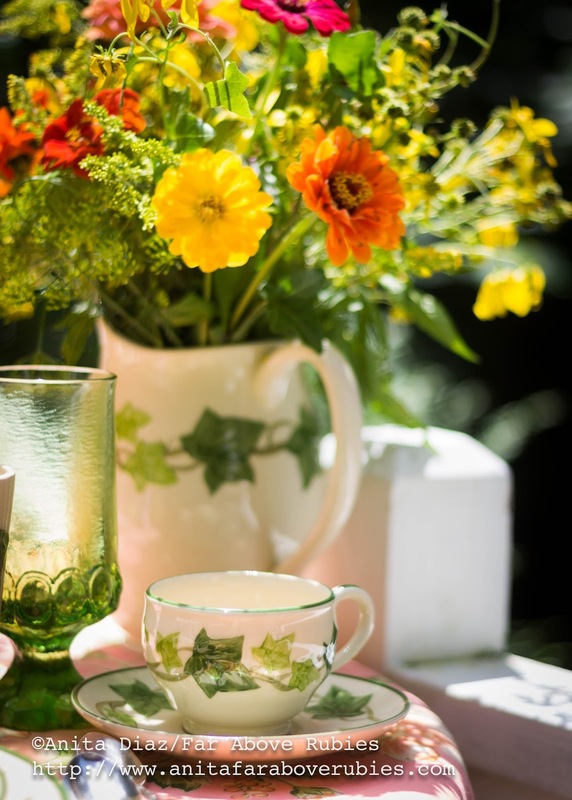 Please, come visit my Lemon Zest post this week! What a wonderful and special gift! 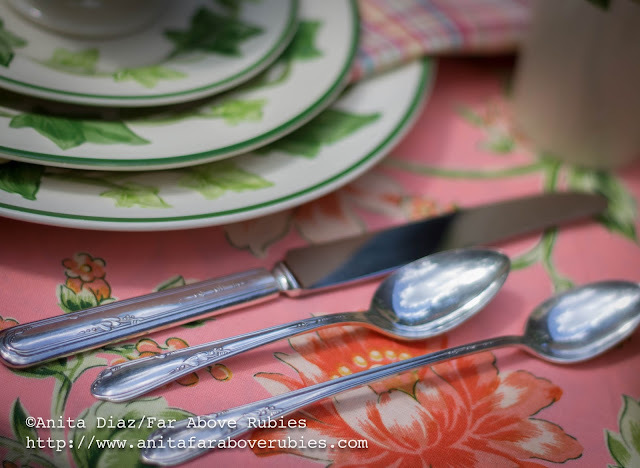 Those dishes are divine and perfect with the vintage cloth. Score! Anita, what a wonderful story! It is just right that these dishes are with you, someone who appreciates and honors them. Your setting is just beautiful. I don't know how you ever leave that verdant spot. I have some vague childhood memory of those dishes that I can't quite remember. I know I will be thinking of them.